Geography is a broad and diverse subject that gives you a deep understanding of the world around us. It is central to the key issues facing societies and seeks to explain the relationships between events and their impact, both locally and worldwide. By understanding these relationships, and drawing on historical experiences, the skills gained by studying Geography help prepare you for a career where you can shape our global future. Our schemes of work will give you the ability to better understand the world, as well as the knowledge and skills to understand and decide upon solutions for the future. We will inspire in you an interest and enthusiasm in geography that will shape your life and careers well beyond school. 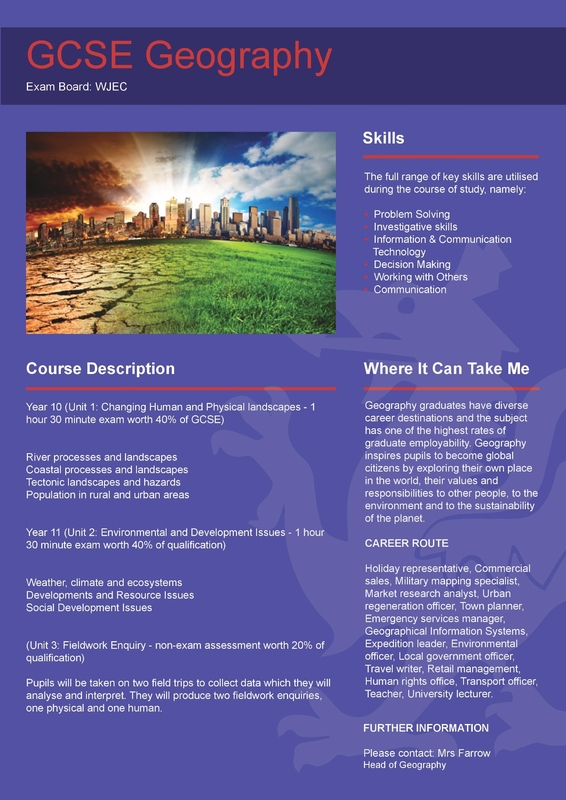 As well as building on familiar aspects of the physical and social world, such as the environment, population change and resource management, you’ll consider the critical global issues and challenges of the 21st century which are likely to affect environments and societies in the coming years.